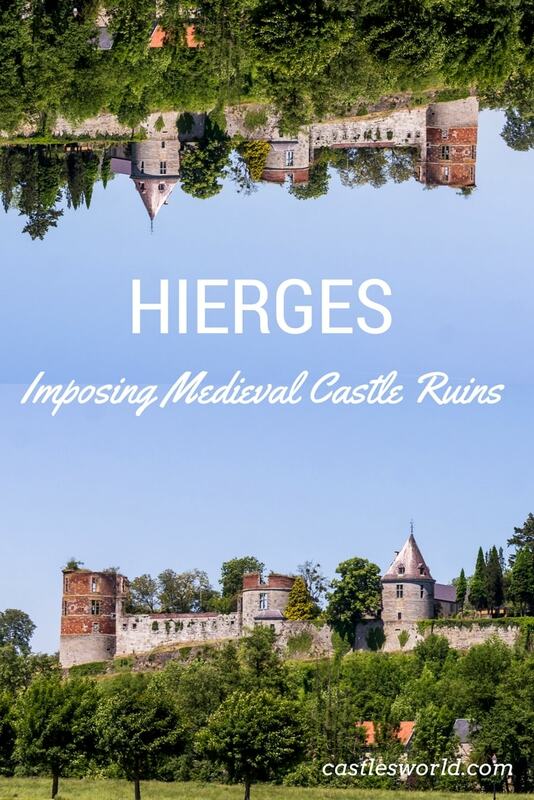 The Castle of Hierges was built on a site of an earlier castrum that dates back to the 9th century. Originally, it was called The Castle of Jerusalem, because in the 12th century, it was home to Manasses de Hierges, who was made Constable of the Kingdom of Jerusalem from 1144 to 1152 during the Second Crusade. During the 12th century the castle was destroyed by fire. It was rebuilt in the 16th century with more space and comfort; the former common and the dovecote were added in the 18th century. During the French Revolution, the castle was assaulted in 1792 and destroyed by fire on the 18 November 1793. Of this Renaissance style castle, there remain the curtain walls and three large round towers, partially ruined, constructed in red brick and blue stone. The fourth covered tower is inhabited by the current owner. The exterior gardens were also recreated to present the appearance of the Renaissance time. Parts of the castle and the exterior gardens are open to the public.